1.) Tannins! Tannins are a naturally occurring substance found on the leaves, seeds and bark of some plants. Adding tannins to your jars is really the key to nice, crispy pickles. 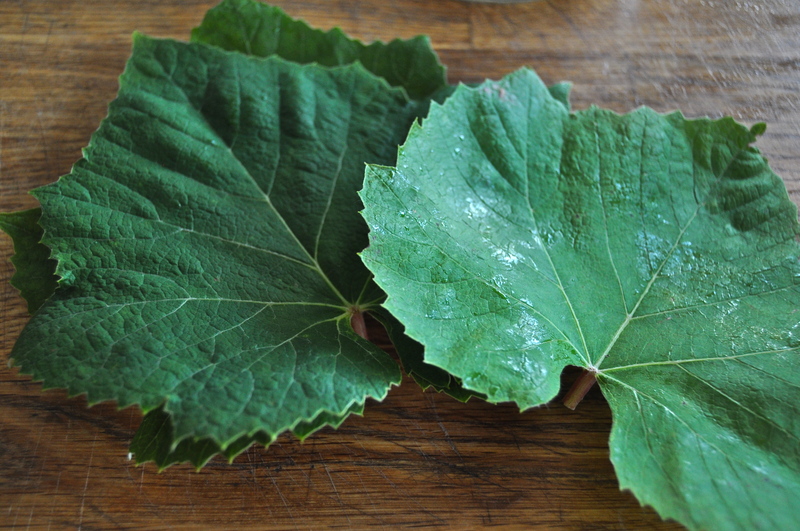 Appropriate tannin carriers to add to your jars are: grape leaves, oak leaves, horseradish leaves, strawberry leaves, or blackberry leaves. Add a couple leaves per quart if using one of these options. Tannins are also found in tea so if you don’t have access to a garden, you can throw a bag of green, black, or white tea into your jar and it will work beautifully. 2.) Before you begin, soak your cucumbers in ice-water for about an hour to crispin them up. The blossom end of cucumbers has enzymes on it that can cause the cukes to go soggy. For the ultimate crunchy pickle, scrub this end or thinly slice it off. The blossom end can usually be identified because it is bumpy where the blossom used to be, compared to the smoother end of where the stem used to be. If you can’t tell which end is which, cut thin slices off of both ends to be safe. 3.) 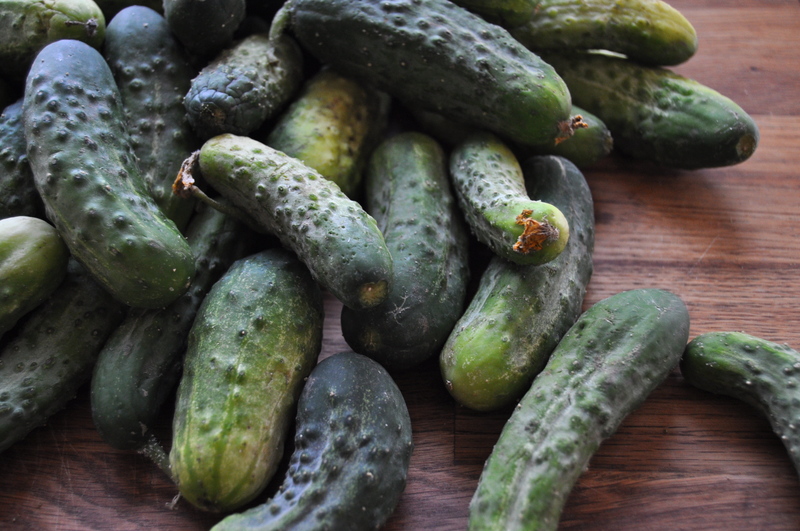 Get the freshest pickling cukes that you can find. 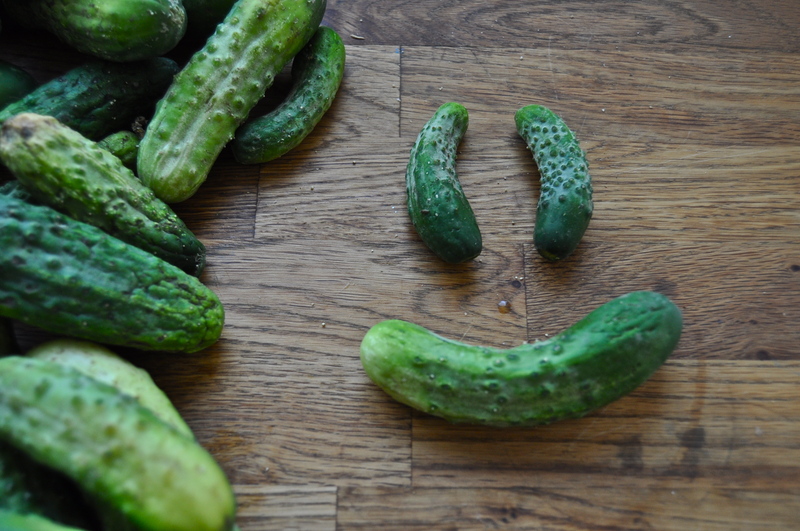 The best cukes for pickling are small, firm and ugly (covered with warts and bumps). Connect with a farmer’s market or local farm as they can supply you for a great price. I give the instructions for 1 quart jars, but multiply as needed. I made 20 lbs worth! Put 1/2 of the tannin source and spice ingredients (1/2 of everything but the cucumbers) into the bottom of your sterilized mason jar. Start placing the cukes into the jar. Be strategic with your layering. The tighter packed they are, the less likely they are to spoil. Pickle tetris time! When there is an inch or 2 of headspace at the top of the jar add the rest of the spices/tannins. At this point, make your brine. Stir to dissolve salt into water. Pour brine over pickles, leaving 1 inch of headspace. At this point you need to add a weight to the top of the pickles to keep them submerged. The CO2 produced in the fermenting process will encourage them to float which will cause spoilage. 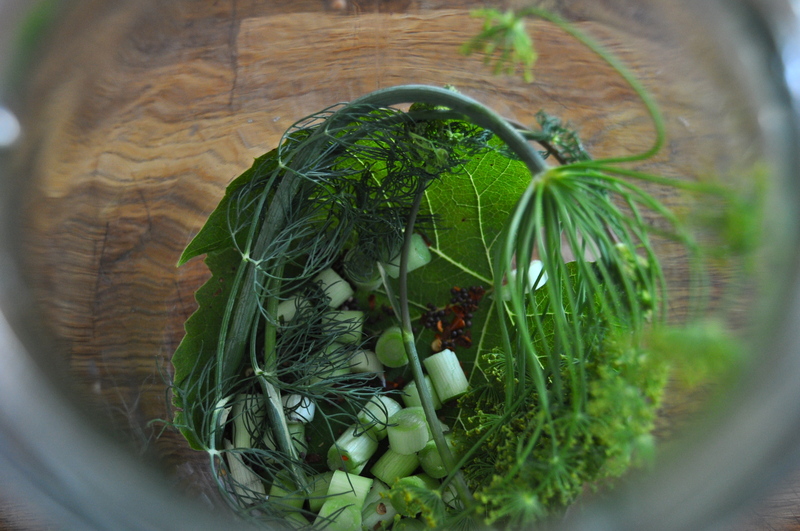 If you are fancy you will have a culinary weight designed for fermenting. If you are like me you will use a rock from the garden that you boiled. Anything will work, just something that you can sterilize (boil) that will fit inside the mouth of your jar and keep the pickles submerged. A lot of people use a ziplock bag filled with water (no need to boil), a small jar filled with water, or a shot glass as a weight. After you add your weight, close your jars. Fido jars (the one on the bottom right) are usually recommended as they allow gasses to escape. If you are using mason jars, like I did, make sure after you put the lid on you unscrew it half a turn to allow gasses to escape. I use a dark cupboard. 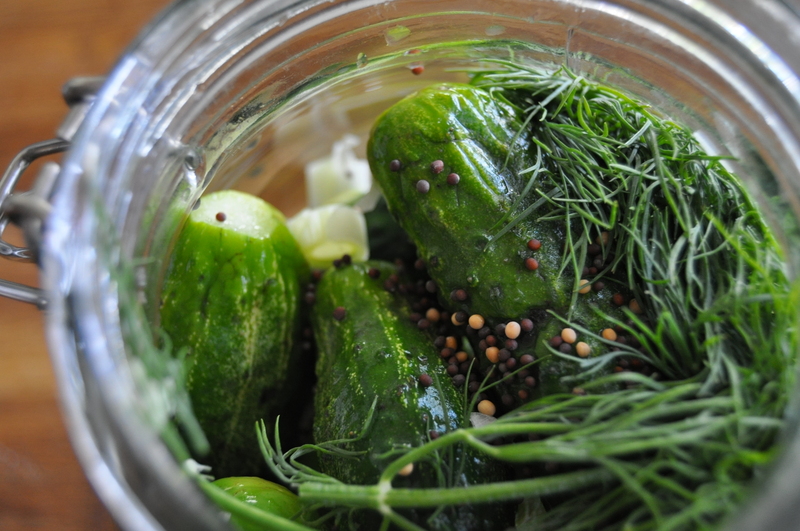 Place an old tea towel or an old baking sheet underneath the pickles as they will likely leak brine as they ferment. Because there is so much variance with fermentation times (depending on the size of the cukes, the temperature in the house, etc.) it is hard to give an accurate timeframe. 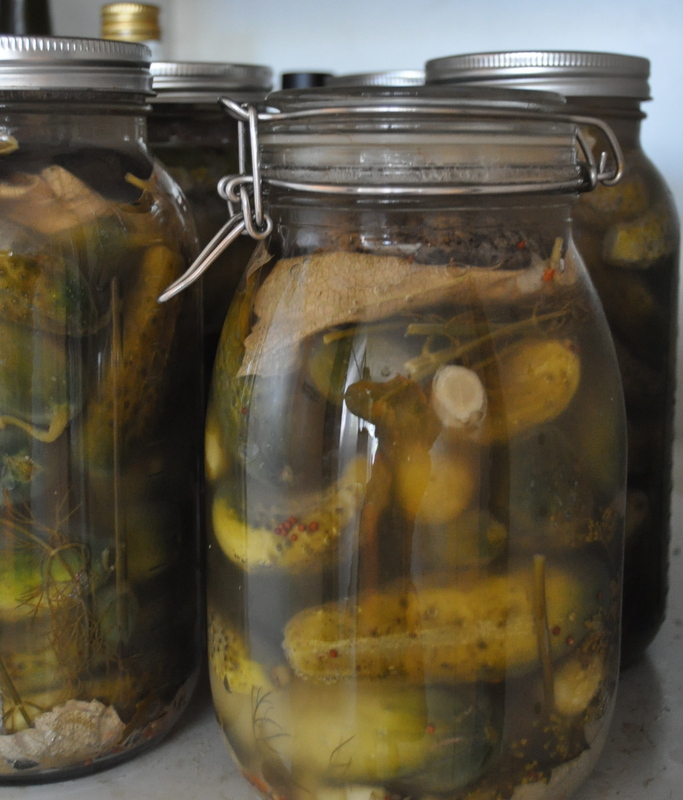 Start tasting your pickles at the 1 week mark. Mine usually take about 2- 2.5 weeks. They are done when the cucumber has been pickled throughout with even colouring throughout the pickle. The jar will appear cloudy and there may be white sediment at the bottom (see picture at the top of this page). This is totally normal. The saltiness should have dissipated and the flavour will be rich. This entry was posted in raw, snack, vegan, vegetarian and tagged cultured, dairy free, gluten free, lacto-fermented, pickles, raw, traditional, vegan. Bookmark the permalink. Great post. I’m so happy I found this. I didn’t know that about the vinegar !!! Great info. So the fido jars is the one with the latch to close it ? Glad you are here! Yes the fido jar is the one with the latch 🙂 Enjoy your pickles! So glad I found your blog! 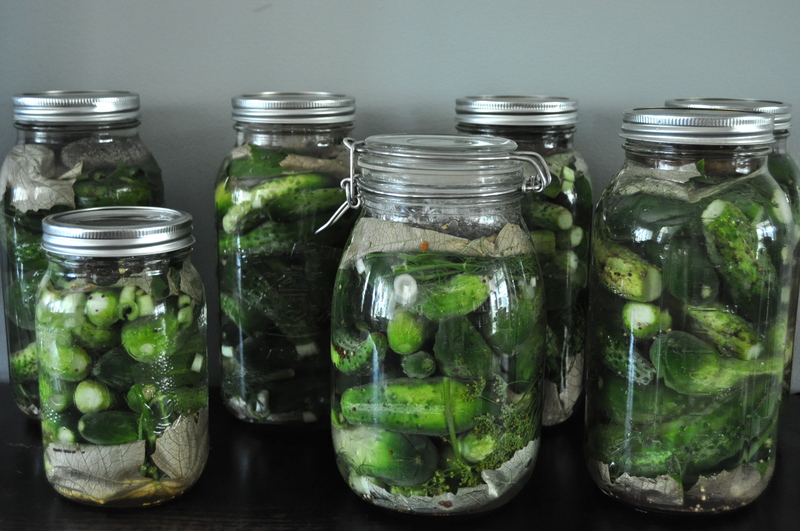 Making these pickles now, my last batch of fermented pickles turned to mush, and white?? I use english cucubers and slice them. Adding strawberry leaves and presoaking this time. how long to they keep? I’m assuming because they aren’t canned they need to be refrigerated after fermentation? Thanks!